For several years now we have been pulling together our annual list of top new social media tools from the year before. It is always a fan favorite and for good reason. As marketers, we love learning about new tools and processes. 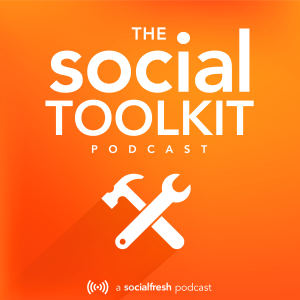 In fact, we get such a great response when we talk about tools, that we launched a podcast about it, the Social Toolkit. Our 11th episode, embedded below, was dedicated to rehashing the list and talking through some of the highlights. Check out the podcast on iTunes and let us know what you think. This year’s list is our longest yet. There were a ton of new tools and a lot of great feature adds for existing tools. For instance, I had no idea that you can now edit Instagram captions (#1 on the list). I clearly need to up my Instagram game a bit. We want to know what new hot app every cool kid is using so we don’t miss out on it. This year those are Buzzsumo (#4) and Slack. We want to know what tool is going to save us time. Look to Edgar (#10) and Likeable Local (#8) and Coschedule (#5) for that. Or even what new tool will make us money, Facebook Video Ads (#3). Also, since we have been doing this for so many years, we wanted to give you a glimpse at the past with the below chart. We compared our Top 10 from the last 4 years. Not everything that makes the list sticks around. Some tools are no longer available because they get acquired or close down or morph into something else. But most of the tools that make the list stick, and stay useful. Buffer (#11 this year) has been in the running every year. For me this shows that they have had steady growth and constantly innovate. Another item that I noticed right away is how old Google+ is, launching in 2011. Crazy. Ok, let’s jump to this year’s list. Enjoy. If you see a “+” sign next to one of this year’s tools, it just means that there were multiple reasons or features added in 2014 for that specific tool. We put Instagram at the top of this year’s list because of the significance of the network’s recent growth (300 million+ monthly active users) and the evolution of the platform’s importance to businesses. Instagram native ads saw some significant use in 2014, with little negative feedback outside of the norm. The shape of tools and apps to support marketing on Instagram has improved in 2014 with platforms like Piqora and Totems usable options for Instagram analytics. Another type of outside app that is helping retailers make sales from Instagram engagement serves as a product bookmarking tool. Like To Know It allows users to get an email about products they LIKE in Instagram photos. This requires both the retailer and end user to opt-in. Over the last 12 months Instagram also added the ability to tag photos, added some major new image editing features, you can now edit captions, they added private and group messaging, and we saw a new spinoff app for time-lapsed video, Hyperlapse. As we move into 2015, I want to see Instagram’s business tools continue to evolve. They need to add some real native analytics and open their ad platform. LinkedIn now has over 300 million total users. But they have never been very forthcoming with numbers on how many of their members are active on the site monthly or daily. LinkedIn has always been more of a resume archive for many members and less of a place to engage other professionals on a regular basis. Launching LinkedIn Publisher in 2014 was a big step in changing that direction for the social network and giving their members a reason to return more often. LinkedIn is now in the content business and their members are writing for them for free. Overnight LinkedIn has become a major source, and could quickly become the leader, in content for professional thought leadership. For years, Facebook has been jealous of the love that Twitter gets every Superbowl. Well, this year, Facebook has a way to make a little money off the big game, video ads. Video ads on Facebook offer an interesting opportunity for businesses of all sizes. It gives big brands an easy place to spend more of their huge TV ad dollar budgets with Facebook. But, it also allows small to medium businesses a great place to build more engagement in their advertising online. “Video requires more effort and investment on the part of the consumer. It’s much easier to view a photo than a video. But videos are much more powerful for relationship building and motivating a consumer to take action (purchase a product, attend an event, etc),” said Ryan Cohn, Facebook ad expert at Sachs Media. Facebook is such a powerful player in digital marketing that they could greatly increase the use of video ads online with this move. 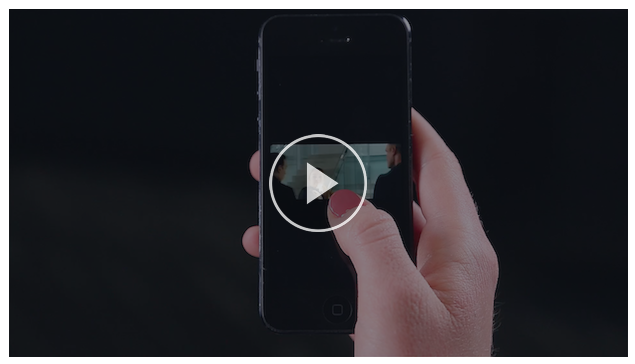 For the time being, Facebook is putting a lot of weight onto video ads in the newsfeed. This means that videos ads could be the best option for your money when it comes to targeting consumers on Facebook. There is a clear barrier to this opportunity, but the opportunity for businesses is worth the effort. Find out what content is working well in your industry, niche, or with your competitors. BuzzSumo gives you many ways to research what content is succeeding on social. Coschedule (partner) is perfect for any social media team that calls WordPress home. It helps manage the editing and scheduling of all your blog posts, and allows you to schedule all your social share straight from the post page. This is a simple app that fills a big void. And it is only $10 a month. Slack wants to kill email, replace all other chat apps in your business, and simplify collaboration. So far, they seem to be doing a good job at achieving those goals for a fast growing group of business customers. If your company is hip at all and not a direct competitor, you will likely be trying Slack in 2015, if you haven’t already. Refresh creates a dossier for you on people you meet with or know based on info available from social networks, your calendar, other apps you use, and your own personal notes. From knowing what sports teams someone follows to how you met them and more. Likeable Local (partner) is the social media easy button for small business. They take over a large amount of social marketing for the small business that struggles to find the hours to create a consistent social presence. Likeable Local’s focus is on content curation and social ads, leaving the customer service and 1-on-1 engagement to the business itself. Meshfire is a Twitter management tool that aims to make engagement on the platform more human. Their visual interface is based on cards that they automatically create based on your Twitter account. They are suggestions for what you should do next: reply to a user, reply to a DM, engage with a user, etc. The software learns where you need to put your attention for you. Meshfire wants to make real engagement on Twitter easier to accomplish. Edgar is a content scheduling and distribution tool that adds more features and customization than similar tools like Hootsuite or Buffer. Edgar saves a library of all your past content in categories that you can customize. This feature allows you to go back and reuse content that has future value. The categories also allow you to differentiate between categories of our content. So if you save 10 promotional Tweets into Edgar all at once, they will only publish once a week or however often you set that schedule. There are plenty of other features, but if you have ever wished for more customization options for your publishing platform, give Edgar a try. 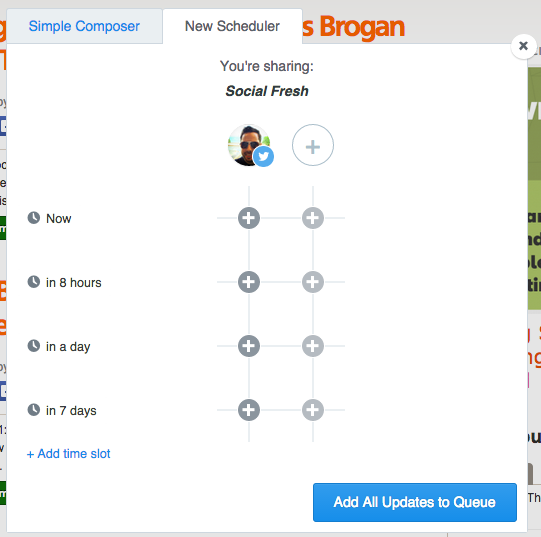 Buffer added the ability to schedule out multiple posts over several days, weeks across accounts. This is a great addition for users that repost content multiple times in order to reach a larger percentage of their followers and fans, especially common on Twitter. Buffer also launched a new app called Daily for helping social marketers find awesome content to share. They curate a list that you can sort through easily, swiping right right to add to your Buffer and swiping left to skip. Another feature addition to Buffer, Feeds, was allowing users to loads and Buffer links from RSS feeds. Many tools allow you to automatically share content from an RSS feed or multiple feeds. Buffer’s approach of giving you a mini-RSS aggregator in the app, but forcing the issue of the end user curating from those feeds was a very intentional and unique step. Buffer also saw some major growth and adoption in the industry this year from larger business customers. As Buffer consistently grows and innovates, they have become one of the few tools in the industry that everyone knows well and many use as a key piece of their social sharing workflow. In 2014, Synthesio (partner) launched Command Center, giving their customers an all-new way to visualize and take control of their social presence. In one sleek view, brands can monitor top-level social metrics, mentions and geolocation data in real time. Command Center has four widget panels — Top Influencers, What People Are Saying, World Map and Word Cloud — that give their customers an up-to-the-second picture of their social footprint. For Synthesio’s customers, large and global brands, this type of dashboard solution add a rare simplified view of what until now has been an impossible complex dataset. Rainmaker is a new all-in-one website solution for digital marketers by the increasingly software savvy Copyblogger team. It is based on WordPress, but takes away a lot of the need to hire designers, developers, and search for plugins. Out of the box, it includes customer landing pages, membership support, podcast pages, and a lot more. We are big supporters of Leadpages (partner) here at Social Fresh. We use them for our Social Fresh Tips subscriber page, all of our webinar landing pages, and several other of our lead generation efforts. One of the reasons we use them is because they are constantly adding templates and features based on research and the best practices from other digital marketers. One big feature they added in 2014 was Lead Boxes. This is a simple change in the average lead form or newsletter subscriber box, but produces a big result. A Lead Box changes the normal email signup form you might see in a blog sidebar to a 2-step process. Instead of entering your email and then clicking a “subscribe” or “sign up now” button, you would first click the button, with no form. That then launches a Lead Box, which is a simple pop-up box. That Lead Box has your email form. At first glance you might think adding an extra step to the email process would be a bad thing, but Leadpages says this feature can increase your lead conversion by 30% on average. And we have seen those exact numbers with our testing on socialfresh.com. The Competitive Benchmark report from Simply Measured report was gives their customers a way to aggregate, standardize, and compare their social performance, both owned and earned, across all their different social networks. This is a set of data that gives brands a very quick understanding about where they stand across social networks and against competitors, industry averages. This type of report use to take many hours, but Simply Measured just made it much, much easier. We started using Thinkific (partner) in here at Social Fresh for our Content Marketing Template course and other digital courses we plan to roll out in 2015. It is by far the easiest system yet for creating online courses. They give you all the tools and resources you need to quickly create an online course or training community. And if you want to sell that course, they help you do that too. Content marketing is increasing focusing on education your audience and becoming a trusted thought leader. Thinkific is a great tool to help businesses in that pursuit. I’ve heard more and more about Opal through a lot of big brands this year that are turning all of their campaign planning over to the platform. They are used by NASA, Nestle, Levi’s, Target, Nike, Intel and many other big brands. Say goodbye to reporting your digital marketing analytics using PowerPoint reports. Origami Logic aims to change the analytics game by taking away the spreadsheet and making your marketing reporting search powered. Producthunt is a simple crowdsourced list of new apps, services, and websites with a technology focus. Anyone submits their new product and other users upvote the ones they like best, similar to Reddit or Hackernews. You can subscribe to their daily email summary. 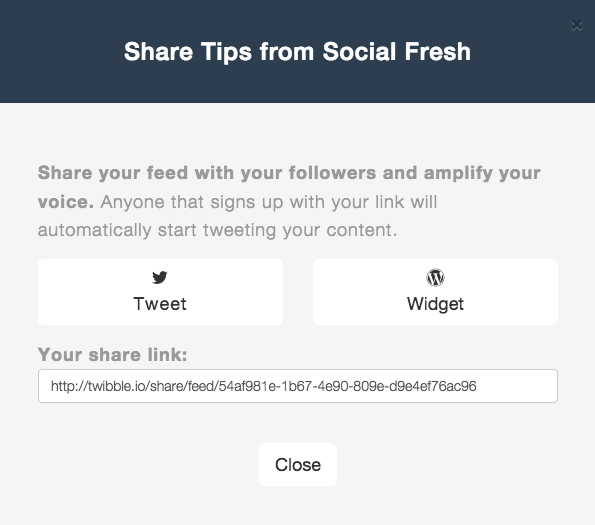 Twibble is a very simple tool that helps you share your blog posts to Twitter automatically. Similar to Dlvr.it. But one feature they have that is unique is the ability for your audience to also automatically tweet your blog posts. For instance, we recently shared on Twitter a way for the Social Fresh audience to automatically share our social media tips blog posts to Twitter for us on our behalf. Once you click through and sign up, you can decide how often you share our blog posts. It’s a great way for your biggest fans to support your content.